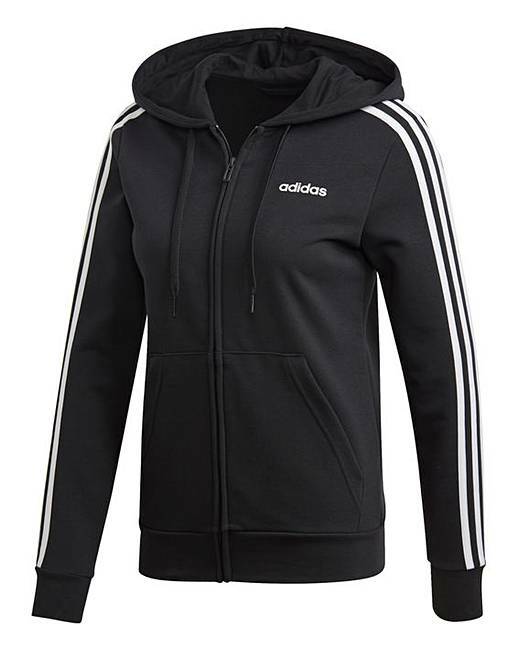 adidas 3 Stripe Full Zip Hoodie is rated 4.0 out of 5 by 3. This adidas stripe full zip hoodie has a simple streamlined style that's designed for going from sport to street. The straightforward track jacket features the iconic 3-Stripes down the shoulders and sleeves. Built with cotton and recycled polyester French terry, it has a concealed zip and slim fit for a sleek profile. Rated 2 out of 5 by Jennie71 from Bad sizing I ordered this thinking it would be a lovely addition to my wardrobe. It arrived and although the size I got was exactly the same as the other items I had ordered it would not go anywhere near me. It was really short in the body and the sleeves were so tight. I daren't even attempt to fasten this as it barely for around my waist or bust.